Senior guard Bridget Carleton nabbed her second Big 12 Player of the Week honor of the season, the league announced Monday. Today’s honor marks the 12th Big 12 weekly honor for the Chatham, Ontario, Canada native, which ranks first in school history and sixth in Big 12 history, passing Oklahoma State great Andrea Riley with 11 in her career. 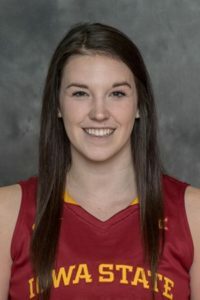 Carleton led Iowa State in an 86-81 win over the Drake Bulldogs. She scored a game-high 31 points, grabbed eight boards and tallied four assists and four steals in the win. Carleton’s 30-point performance marks the seventh time in her career she notched 30 or more points. Carleton now ranks third in school history in scoring average, averaging 15.9 points per game in her career. Carleton is also currently first in the Big 12 in scoring, netting 19.0 points per game. Iowa State is back in action on Wednesday, Dec. 19 when it takes on Prairie View A&M. The game will begin at 6:30 p.m.